New Celtic Woman CD & DVD – Celtic Woman releases new Emerald: Musical Gems and North American Tour with over 80 concert performances in progress for the popular Celtic group. Celtic Woman is making music news this week by the release of Emerald: Musical Gems, a digital CD with 12 traditional Irish songs, which includes an additional free MP3 download version at Amazon. Released on February 25, 2014, an accompanying DVD with 18 songs by the same title is also available. Celtic Woman’s North American Concert Tour has begun, and is expected to cover over 80 concert shows in North America. Later in the year on October 13, 2014, Celtic Woman begins their European Tour, covering cities in the countries of Belgium, Germany, Holland, and Switzerland. It’s been quite a year for the group, having attained the Top World Album of the year at Billboard for the Celtic Woman Home For Christmas album. Billboard likewise awarded Celtic Woman the World Artist of the Year, which is the fifth year in a row for the ultra-popular vocal instrumental group. 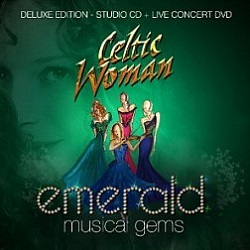 The CD version of Emerald: Musical Gems, contains 12 song of the traditional Irish fare that has propelled Celtic Woman to modern day music celebrities, who continue to dazzle the world. The 12 song of traditional Irish favorites on the Emerald: Musical Gems CD are: Mo Ghile Mear, Dulaman. Caladonia, Amazing Grace, The New Ground, She Moved Through The Fair, Bridge Over Troubled Water, Nil Se’n La, Danny Boy, The Voice, The Parting Glass & You Raise Me Up. Sample or purchase at CelticWoman.com and find complete 2014 concert date information at the Celtic Woman Tour Page. Cover art courtesy celticwoman.com. Publicist and blog host John P. Olsen had an opportunity to interview famed singer, harpist and instrumental recording artist from Ireland, Moya Brennan. During this interview taking place during the summer of 2013, a variety of in-depth topics are covered. Included is a conversation about her new vocal and instrumental album with professional harpist Cormac De Barra titled Affinity. 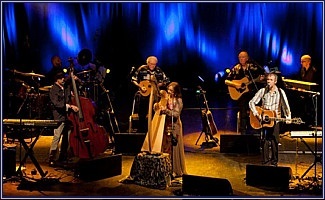 Moya Brennan also details aspects of her life and solo career, and of the Celtic music group Clannad. 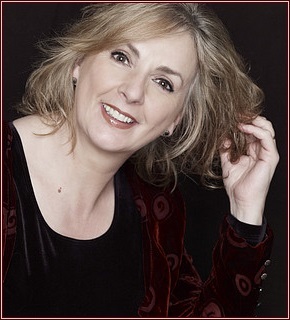 Recognized as the First Lady of Celtic Music, and The Voice of Clannad, today I am pleased to present an informative interview conversation with the famed Irish musician, Moya Brennan. John P. Olsen: Thank you for accepting my interview invitation Moya! Interest in your music has grown tremendously over the years, and you have a wonderful story to share. Like your fans, I am a longtime admirer of the music you have produced too, so it’s a privilege to host your newest interview for fans and visitors in 2013, here at New Age Music World. Shall we begin our conversation with the topic of your brand new album with Cormac de Barra titled Affinity. Your newest album is now available at your Voices & Harps website, and currently available at major music stores like Amazon and iTunes. I have been listening to Affinity non-stop, and consider it to be one of your best albums yet. It makes me curious to know if others share the same view as I. What is the feedback you have received so far on your newest album, and is the response what you expected? Moya Brennan: John, thank you for your kind words about Affinity and I’m so glad you are enjoying it. You’ll be pleased to hear that you are not alone in reacting to Affinity in such a way. Feedback has been really positive (and sometimes verging on the superlative!) To say that this is what we hoped for would be spot on but what we expected? I’m not sure. Of course we are supremely proud of the album but I have been working for long enough to know that you can emerge from the bubble of the studio thinking you have redefined the musical universe, only to discover that the rest of the world doesn’t necessarily share your feelings. All I know is that the musical partnership I have developed with Cormac is far greater than the sum of the parts and that our song choices, arrangements and performances are of the best we both have to offer. John: Affinity is the follow-up album of your earlier release with harpist Cormac De Barra titled; Voices & Harps. Another fine release I might add. What would you say are the distinctions in theme and melody in comparison to your newest release? Moya Brennan: To give you some background, Voices & Harps was recorded on an inspired whim! That’s not to say we didn’t put our hearts into it. More that it was something we’d been talking about doing for several years and a little three-week window opened up early 2011, which we jumped through and emerged with our first V&H album. We sat back and listened to it in the cold light of day and were thrilled to have achieved so much in such a short space of time. As with Affinity, I think we surprised a few people – and ourselves. Cormac has been quite a significant force for me rediscovering the beauty and purity of my traditional roots. In my solo work I have explored quite a lot of contemporary forms along with musical influences from around the world – for instance Eastern Europe and Africa. Cormac’s repertoire and knowledge of the Irish tradition is incredible so this was always our starting point. 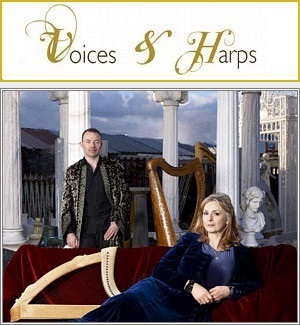 The theme of Voices & Harps was as simple as the title. I arrived with my voice (and harp) while Cormac arrived with his harp (and voice). Sounds funny but we both came to each other with the same skills, albeit with different emphasis respectively. We chose some songs and tunes that we both had been performing already, some which we had always wanted to record and we wrote others which encompassed my approach to atmospheric vocal layers with a harp foundation. When we came to record (what turned out to be titled Affinity) the approach was similar but with attitude made bolder by our happiness and reaction to our first album. We were actually going to call it Voices & Harps II but realized that the title, Affinity, once again, summed up our performing relationship and the blending of our musical skills. John: What is the creative drive behind your newest album composition Affinity? Moya Brennan: Echoing what I said previously, our creative inspiration is a bringing together of what we do well! Maybe, more than anything though we let ourselves go a bit more than before. Sure, there are absolutely beautiful songs which we both of learned from our grandparents – Ardaigh Cuan from my grandmother and Seoithin Seo from Cormac’s – but we felt we had the confidence to write new songs as well. While we both grew up surrounded by traditional music we have also been open to a wide range of musical influences. So there is the dreamy, trancy ambience of song Suas Sios, and a contemporary slant to Worlds Collide and I Feel You Breathe. I should also mention The Lass of Aughrim, from Affinity. I was invited to perform at a Galway alumni dinner in New York last year. The Galway Association were to honor Angelica Houston as part of the ceremonials. I had always been moved by her part in the John Houston movie, The Dead, based on a James Joyce short story. This song appears at one of the most poignant moments in the film and I heard that she loved the song. It brought her to tears at the dinner and afterwards she said that we must record it. So we did and have her to thank for encouraging us. John: The chart topping hit song Sailing by Christopher Cross is a lead single on Afffinity. I read in a press release the cover song Sailing holds special meaning to you on a personal level. What is the personal significance of the song Sailing? Moya Brennan: Hey, I think what I said is that it was part of the soundtrack of my youth. So in the respect that it will forever bring me back to that stage in my life I’m not saying it has any emotional or cosmic significance! It’s a beautiful song and an unusual song. Cormac and I had been toying with the idea of doing a cover song and we were nearing the end of the process of choosing our final selection. I was driving back from a concert in Cork and just as I pulled into the house in Dublin Sailing came on the radio. I had my daughter, Aisling (my band guitarist and album studio engineer), in the car and we sat and heard it out. I wondered how it would translate to harp and vocals but when Cormac came in the next morning he played around with the intro on the harp (some devilish key changes) and eventually broke through to provide the song with familiar, but new, bedrock. Lyrically, it’s a song of hope and dreams – subjects that I love to visit in songs anyway. As you can imagine, our cover of this song has surprised a lot of people but nobody has said that it feels out of place among the others. John: Harpist and television host Cormac De Barra is also a member of your band and the group Clannad. In addition to the numerous albums you and Cormac have produced together you each have achieved successful solo careers. How did you and Cormac meet and form a professional team Voices & Harps? Moya Brennan: In 2004 I recorded my Two Horizons album. This, more than any other recording I have made, was a concept album. Starting with the Thomas Moore song, The Harp that Once Through Tara’s Hill, I developed a story line bringing a mythical harp through the ages, through slavery in Africa and emigration to the wilds of an American desert populated by native women played the harp in their traditional ceremonials. My (then) musical director Fionan De Barra, introduced me to his brother, Cormac, whose harp playing instantly provided a fullness to my stage setup. We have worked together ever since and discovered an interesting fact that less is more. It is such a resonant and powerful instrument that often, very little else is needed. John: During the course of your music career you have toured extensively in many parts of the world. Would it be fair to say you simply adore the personal interaction with an audience while performing live shows? Moya Brennan: I absolutely love it. My father spent his life on stage – firstly in a traveling show band and then as host in his own music pub in County Donegal – and I’m convinced that I take after him. I love the way that you can engage an audience and draw them into your world – even if they are unfamiliar with your work. I love bringing people to another place in shows (even for ninety minutes) and hearing how afterwards how they were able to shake off their stress and troubles for that short period as they became absorbed in what was coming from the stage. John: Even today you perform live concerts, and recently gave a Voices & Harps Workshop last month. Could you tell everyone about your live performances and provide details about the workshops? 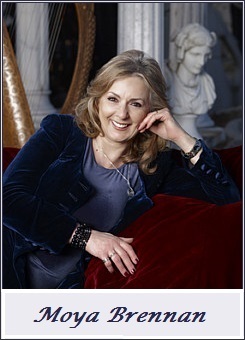 Moya Brennan: Cormac and I do the workshop every June and have just completed our third year running. This year was a sell out! We keep to limited numbers in order to give everyone direct and personal attention. I work through a choice of songs with some and Cormac works on harp tunes with others. At the end of the weekend the two meet in a thrilling showcase. I say thrilling deliberately because I see people who have walked in on the Friday with virtually no experience singing and playing on stage for the first time and literally going through a life changing experience. John: What song selections can a concert attendee expect to hear during a live concert with Moya Brennan? Moya Brennan: I think I gave a taste of that in an earlier question. I like to create an atmosphere which frees the mind and spirit of an audience. But in a more practical sense Cormac and I obviously play much of our Voices & Harps repertoire, I have a number of solo favorites and, of course, I do visit some of the Clannad classics from time to time. There’s a bit of everything – from quiet atmosphere to rousing Irish trad sets. John: Music has been a part of your life from the beginning, with many notable achievements along the way. What would you say was the turning point where you knew you were a career musician with a professional career ahead of you? Moya Brennan: You’re right, it started early! I used to go off to Scotland with my father’s band at the age of seven to perform on St. Patrick’s Day. There were two significant moments in our (Clannad’s) career which convinced us that we had this calling. In 1970 we came first in the prestigious Letterkenny Folk Festival. The prize was to record an album which turned out to be Clannad 1. Our music was almost exclusively in the Irish language and, strange as it may seem now, nobody in Ireland wanted to listen to songs in their native language. So we’d go off to Germany in a battered van and drive up and down the autobahns playing to audiences who couldn’t get enough of it! Yes, bizarre! In 1978, during a German tour, we received a standing ovation in the classic Bremen Town Hall. As we glowed in the dressing room after the show we suddenly realized we could do this as a career and returned to Ireland as a professional band. John: There are a number of original songs on Affinity sung in Gaelic, which is the native Irish language. It is in part a reason for the surge in popularity taking place during your solo career, and of the group Clannad, in which you are a founding member. What is it about the Gaelic dialect, blended with melodic themes that have generated so much interest? Moya Brennan: As I said above, there was a time when we were actively discouraged from singing Gaeilge songs. Ireland of the seventies was only forward looking and chose not to think about its traditional culture. Thankfully, things changed slowly and we are so pleased we stuck to our principles and language. Irish is a very different to other European languages. It allows us to reflect images of our natural surroundings in a true way. Many of our songs celebrate the sea, mountains and ruggedness of our native Donegal. I’m so proud of my language and it combines beautifully with my music. John: Clannad’s influence on the merging of traditional Celtic and pop music, including Celtic Fusion in the 1980s and 1990s cannot be overstated. I read at the Clannad.ie website that a new follow-up album to Clannad at Christ Church Cathedral CD & DVD is scheduled for release in September of 2013. Can you provide any news or information regarding the new Clannad album for 2013? Moya Brennan: I do believe we were pioneers in bringing Celtic music to a wider audience with contemporary influences and instrumentation. Although it didn’t make us popular with the trad community at the time, it’s interesting to see how the form has been followed, imitated and developed into a distinct musical genre. We have just finished recording a new Clannad album – the first studio album since 1997. It will be released in September this year and the title is under wraps for now. John: You have enjoyed a stellar music career with many successes, awards and recognition along the way Moya. What do you find most rewarding intrinsically as a professional concert and studio musician? Moya Brennan: It has to be winning the Letterkenny Folk Festival in 1970. I know there have been many other incredible moments but this probably changed my life more than any other. John: Would you like to tell us about your charitable endeavors and work as a goodwill ambassador, and why is philanthropy important to you on a personal level? Moya Brennan: I hope that what I do comes from my heart and in that applies equally to my music and my charity work. Like anyone else, I am seriously humbled by those who dedicate their entire lives to helping the disadvantaged and downtrodden. I do get asked to be involved in far more than I am able to take on so one thing I have chosen is to broaden awareness of the disability charity, CBM. Although they originally set out to work with blindness they have come to realize that lack of sight is just one of a number of common disabilities in the developing world which leaves its sufferers as marginalized and hidden in their communities. As a Goodwill Ambassador I have traveled in Africa and South America to see CBM’s amazing work and bring back my experiences to remind people how fortunate they are and how much needs to be done to provide decency and respect for the disabled. John: I know for a fact that artists at various stages of their music careers will read our interview Moya. One question I always like to ask a highly successful artist like yourself is; would be willing to offer any helpful suggestions about the music business, or offer some words of advice to artists just beginning their music careers? Moya Brennan: The music business has changed so much since I started. There was once a time when we could survive quite well just on record sales. Those days have gone and it has become far more important to get on stage and engage your audience in a live setting. But the universal truths still remain: Believe in what you’re doing, don’t be discouraged by rejection, remain true to your art, practice your instrument (or voice), share ideas with others you trust and learn how to express them to a wider audience. John: As a publicist I like to report on current music news information when I can, so I would like to ask if you have any press information you would care to pass along about additional album projects or upcoming special events you plan to make public soon? Moya Brennan: I am currently planning a Christmas tour in the USA in December. Final details have yet to be settled but will appear on my website in due course. I recorded a Christmas album a few years ago and, amazingly, it hasn’t dated over the years. I normally tour it in Europe so this will be the first time American audiences will experience An Irish Christmas. John: I look forward to providing more information when available Moya, and must say you have experienced a fascinating life and career. It has been a privilege to host your newest interview in 2013 and I wish you continued success in the years ahead. I hope we have a chance to visit again to update everyone on the current news about you. In closing for now, is there anything you would like to express to our readers, and fans that have supported you throughout your career? Moya Brennan: Nothing but immense thanks and appreciation for letting me do what I enjoy and share it with fans. Their loyalty, friendship and encouragement are what keep me going. Moya Brennan and Cormac De Barra’s new album Affinity is currently available in physical CD format and Mp3 format, or single song downloads at VoicesAndHarps.com. You may sample and purchase the 12 songs on Affinity at Amazon.com and find the album or single song downloads for Affinity at iTunes. Find albums and concert info at MoyaBrennan.com. Interview photos courtesy moyabrennan.com & voicesandharps.com. Affinity Album Review: New vocal and instrumental album by legendary vocalist Moya Brennan and harpist Cormac De Barra. Two legendary international musicians, Moya Brennan and Cormac De Barra, have proven yet again the unification of top Irish talents is assured to become an endearing vocal and instrumental album like no other. Moya Brennan and Cormac De Barra are gifted musicians of the highest caliber from Ireland, each with successful solo careers and so in this respect their enduring careers as music professionals have without surprise, emboldened the lovely melodic songs they convey to the world. 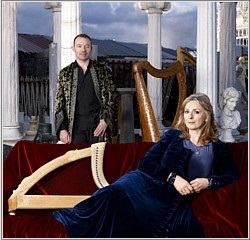 Recognized as the First Lady of Celtic Music, and The Voice of Clannad, Moya Brennan brings her skillful vocal talent to the forefront, while brilliant harpist Cormac De Barra delivers a divine instrumental fusion on their new release for 2013 entitled Affinity. Their newest release follows another exceptional vocal instrumental album from 2011 titled Voices & Harps. Moya Brennan and Cormac De Barra both are famous for their proficiency as vocalist and harpist respectively, which is unmistakable on their newest. Together the Voices & Harps team is supported by a specialized lineup of professional back-up singers and orchestral artists performing on keyboard, guitars, flutes, fiddle, cello, percussion, and more. While some tracks of 12 songs total contain song lyrics performed in English, including a cover song by Christopher Cross titled Sailing; several songs are performed in their native Gaeilge language, similar in style to songs heard on albums by the group Clannad. 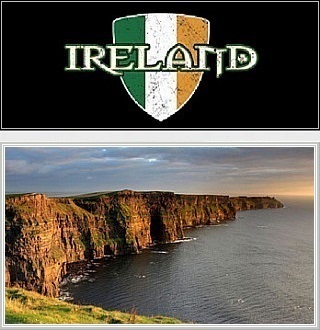 As one would hope Affinity by like minded definition of the word itself, shines by its beauty and refinement, embracing the wide ranging cultural influence of world music and the beloved Celtic melodies of Ireland that have transported them into the limelight of international fame and prominence. If you are looking for one of the finest vocal instrumental albums fulfilling a wide range of musical tastes, especially in the Celtic and world music category look to the professionally driven leaders, and their new album named Affinity. The 12 songs on Affinity are: Intro (Suas Sios), Sailing, The Lass of Aughrim, Worlds Collide, I Feel You Breathe, Cruiscin Lan, Captain O’Kane, Seoithin Seo, Stoirin Rua, When the Morning Breaks, Ardaigh Cuan & Suas Sios. 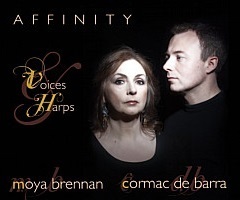 Moya Brennan and Cormac De Barra’s new album Affinity is currently available exclusively in physical CD format and Mp3 format, or purchase single song downloads at VoicesAndHarps.com. Prior to the June 25th release date sample or pre-order Affinity at Amazon.com or sample and pre-order Affinity at iTunes. Visit the artists at MoyaBrennan.com and CormacDeBarra.com. Photo and cover art courtesy voicesandharps.com. 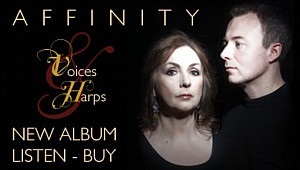 New Vocal and Instrumental Music in 2013 – The Affinity Album by Superstars Moya Brennan & Cormac De Barra. 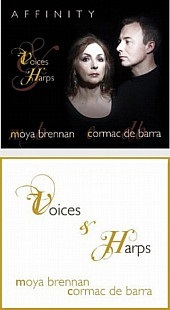 On June 7, 2013 international music celebrities Moya Brennan and Corma De Barra released their new album Affinity at the Voices & Harps website. Pre-orders are currently being accepted at major online music stores for their new album Affinity which will be released on June 25, 2013. Moya Brennan and Corma De Barra are both highly acclaimed artists from Ireland, and their newest release does feature the beloved Celtic melodies of their homeland that have brought them international prominence. After sampling all 12 songs on Affinity, I can say the famed vocalist and harpist, both of whom are revered professionals in the field, have produced one of the finest vocal instrumental albums of the Celtic and World Music marque this year. I would imagine both artists are likewise pleased with their newest combined effort, which is the follow-up to their earlier releases Voices & Harps, and Music of Great Irish Houses. It’s an honor to be among the first to tell fans and visitors about this new release by Moya Brennan and Cormac De Barra, but more good news is on the way. I plan to write an album review for Affinity prior to the release date, plus arrangements are taking place for an exclusive interview with the esteemed Moya Brennan, so check back soon. The 12 songs on Affinity are: Intro (Suas Sios), Sailing, The Lass of Aughrim, Worlds Collide, I Feel You Breathe, Cruiscin Lan, Captain O’Kane, Seoithin Seo, Stoirin Rua, When the Morning Breaks, Ardaigh Cuan & Suas Sios. Below is the vocal instrumental song video Sailing, which is the first single from Moya Brennan and Cormac De Barra’s newest album. Visit the artists at MoyaBrennan.com and CormacDeBarra.com. Photos are courtesy voicesandharps.com.